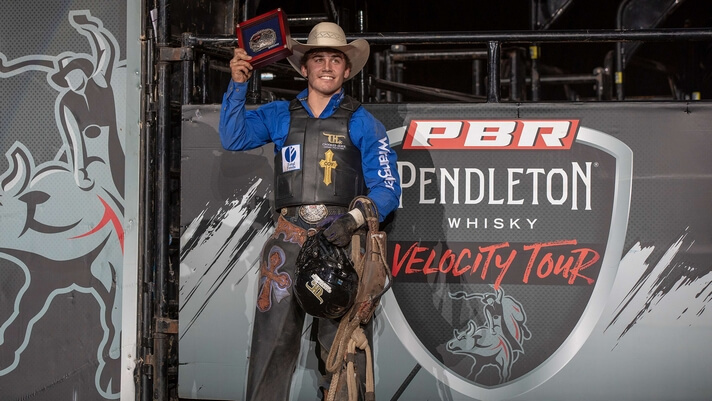 WICHITA, Kansas – In front of an electric crowd at INTRUST Bank Arena, Daylon Swearingen (Piffard, New York) captured the first PBR (Professional Bull Riders) Pendleton Whisky Velocity Tour event win of his career, victorious at the Wichita Classic in Wichita, Kansas. Courtesy of the win, Swearingen also earned an invite to compete on the elite PBR Unleash The Beast in Cheyenne, Wyoming at the third Major event of the season, Last Cowboy Standing, on July 22-23 at Frontier Park. Second went to Paulo Ferreira Lima (Bezerros, Brazil), earning him $9,150 and 115 world points. The Brazilian’s runner-up performance was backed by an 87.5-point trip on Little Tucker (Halpain & Roth) in the event’s opening round. Lima is now No. 43 in the world after beginning the stop No. 59. In an event dominated by the bovine athletes, with just two of 50 outs ending in a qualified ride, Test Me was the high-marked bull of the event. Hailing from GT Bucking Bulls/Cody Garrett, Test Me was marked 45.5 points in his trip with event-winner Swearingen in Round 1. Saturday night also included the American Bucking Bull Inc. (ABBI) Classic event. Goodnight Robicheaux (Dakota Rodeo /Berger/Struve/Willow/Samford) posted 91.8 points to win the ABBI Wichita Classic Champion title for the second consecutive year. For the win, the bovine athlete earned a check for $8,453.50. With a score of 90.2 points, The Right Stuff (Berger/Struve/Willow/Smith/Nix/Owens) placed second to take home $5,423. Skyfall (Silver Creek/Winston/Melton Bull Co) notched a third-place finish with 88.4 points to earn himself $3,987.50. Air Assault (444/Winston/Davis/Durham/D&H Cattle) collected $3,190 for his 88.2-point performance to take fourth, while Test Me rounded out the Top 5 with 87.8 points for $2,711.50. The PBR Pendleton Whisky Velocity Tour next travels to Des Moines, Iowa and Wells Fargo Arena on Saturday, April 27 for the Des Moines Invitational. Action gets underway at 7:00 p.m. CDT.